Every lesson from God’s Unfolding Story for Older Preschoolers includes a Parents Connect page to help parents or guardians reinforce the lesson at home during the week following the lesson. This is The People Honored Jesus Parents Connect Page (NT07L4PC). 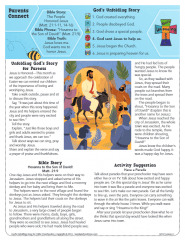 This Palm Sunday parents connect page supports both the Hour A and Hour B lesson plans for this Palm Sunday lesson about Jesus’ Triumphal Entry into Jerusalem on the Sunday prior to His crucifixion. Click on the Get Activity button below to view and/or download the PDF. We also have other Easter related activities and resources to help kids think about Easter and all of the related events in a biblical way.